AC: Did we lose Abu Musab al-Zarqawi? Anderson again in Bakuba, Michael in Baghdad. Michael discusses the report that Abu Musab al-Zarqawi had been in US custody but released. Zarqawi’s insurgent groups have been, in Michael’s terms, “Iraqified” from the lower ranks up, so that local insurgents are now having far more say in how the insurgency fights. 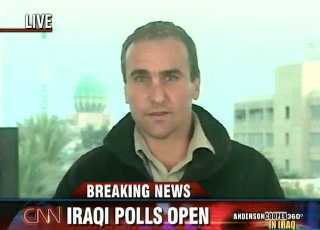 Talk of the Nation, December 15, 2005 · Reporters provide updates on Thursday's voting in Iraq. Turnout was reported to be strong, even in Sunni-dominated areas, where voting in last January's first nationwide election was low. Anderson hosts from Bakuba, Michael’s in Baghdad. Although there were fewer acts of violence than was the case for earlier elections in Iraq, the polls opened while AC was on the air and explosions occurred immediately. Lara Logan interviews Michael on the CBS Evening News about the election and the "bullets and ballots" strategy employed by the insurgents. AC: How will the Iraqi elections go? 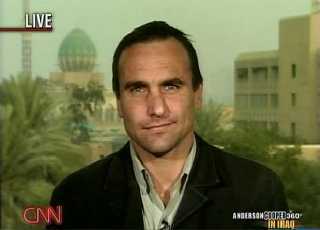 Anderson spends election week in Iraq. On day one, he interviews Michael in Baghdad regarding the “bullets and ballots” dual tracks of the war.